The Hue Animation Studio contains everything that a budding animator needs to create stop motion animation videos. Suitable for home use or for school projects, this is an ideal creative and educational pastime. 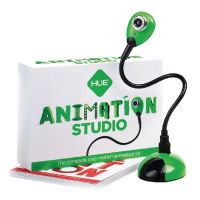 The included Hue Book of Animation features step-by-step instructions for creation 20 stop motion videos, and ideas for even more - enhanced by videos, sound effects and backdrops also included with the Hue Animation Software.